New Pokémon games are a great, yet different experience for all but the advanced battler. Both the games and the Poké Ball Plus are great complements to GO, too. Check out our extensive review on what’s different in Let’s Go, Pikachu! and Let’s Go, Eevee! Anyone who’s been keeping up to date with Pokémon knows how dated the series has been looking. Stuck in the Nintendo 3DS, the games would look visually dated — which comes with being supported on a platform that’s now nearing nine years of life. Never has a Pokémon game gotten this close to feeling like an actual world. It’s therefore unsurprising to see that Pokémon: Let’s Go, Pikachu! and Pokémon: Let’s Go, Eevee! have come to grace the Nintendo Switch instead, bringing the Pokémon role-playing games to high-definition screens for the first time. We’ve spoken at length in our Pokémon Sun and Pokémon Moon review about the Pokémon games adhering to a very similar design — the world centers around the main character in a top-down perspective and objects in the world are generally plotted out to a square grid. 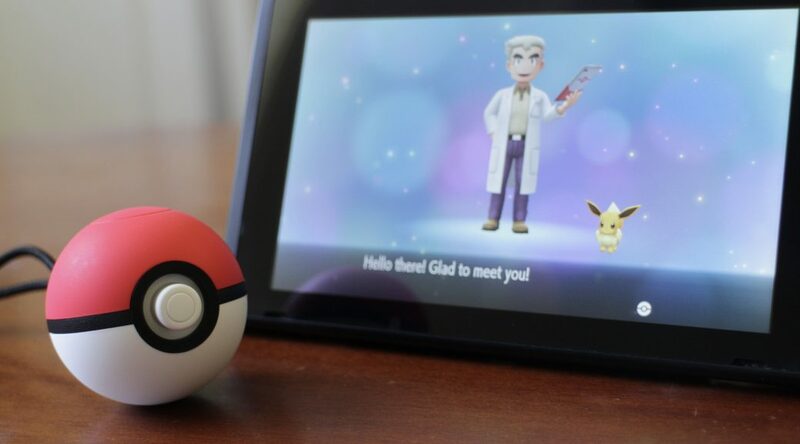 The way the world resembles that of the sixth-generation games — fully 3D, but mapped out the same way — but as a result, feels like a bit of a step back from Pokémon Sun and Pokémon Moon as a result. You could probably forgive it for looking like a classic Pokémon game, though — this is based off Pokémon Yellow. Even if it all looks very familiar, however, there’s some twists in the mix. Pokémon are rendered with realistic lighting not unlike Pokémon GO, in contrast to the flat, cel-shaded sprite-like style from the sixth- and seventh-generation Pokémon games. With a range of the first 151 Pokémon to work with, Game Freak has spent significant time giving each Pokémon unique animations. Wild Pokémon such as Venonat flop on one foot to another as they walk around the world. Ratatta follow their Trainers loosely, scattering all over the place as if to find something to gnaw on. Encounter a Caterpie for the first time, and the first thing it does is scurry away from you before facing you, giving you a chance to catch it. 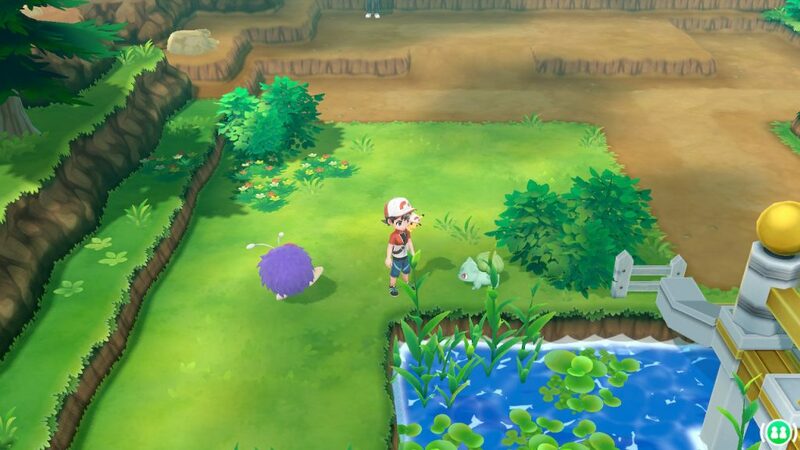 The Let’s Go games have shown significant efforts in making sure the Pokémon in it have been shown at their best, and it’s impressive to see. The best example of Game Freak’s animation work can be seen when you’re interacting with your starter Pikachu or Eevee. Having a dedicated play mode for your starter Pokémon has certainly allowed your starter Pokémon to come alive, with Pikachu or Eevee pulling funny faces, reacting adorably when pet, or giving the player high-fives. It’s this kind of attention that you’d wish was available to all 800+ Pokémon, but that’s a pipe dream since it’d require a lot of animation and programming, so you can’t fault Game Freak on that. It’s in battles, however, the Let’s Go games don’t go the extra mile with animating Pokémon. Your Pikachu and Eevee’s unique attacks are, of course, fully animated in execution, and look great. However, you’ll notice that, much like Pokémon X and Pokémon Y, other Pokémon reuse the same basic animations for each type of attack. You may have seen a certain clip demonstrating the issue, but while you’ll certainly see Lickitung use its tongue in attacks, nothing comes close to how well games like Pokémon Stadium or Pokémon Colosseum animated attacks. You could forgive the 2D games for not doing it. You can also forgive Game Freak for having to account for the many attacks there are, and how many Pokémon can learn them. (As a result, you can’t expect the eighth-generation games to do it, either.) You probably might not forgive that moves like Earthquake have been copied straight from X and Y, though. Yes, tiny man, Eevee rides on my head like that. Like any traditional Pokémon game, human characters are represented in the world with skewed proportions that don’t look too out of place next to the Pokémon. There’s no “mini” player models in this game — the same design is used for the characters in battle and in the overworld — but the characters aren’t designed to the more realistic proportions like they were in the seventh-generation Pokémon games. But while the human characters look nice, most of their animations are ridiculously stiff. 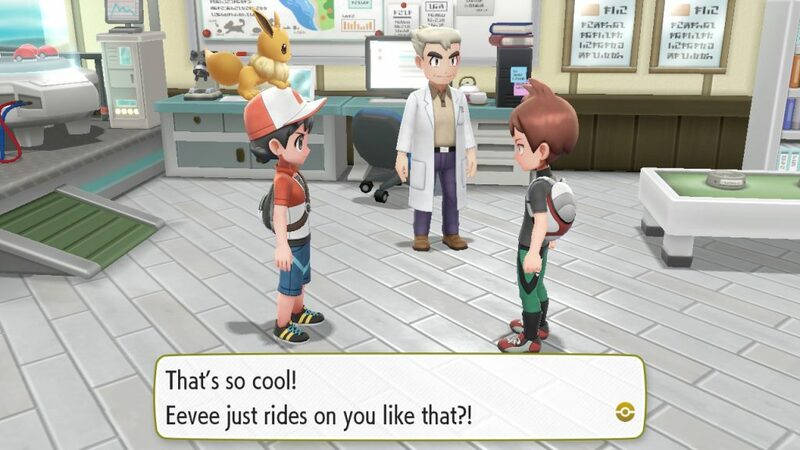 The human animations appear to have been recycled from Pokémon X and Y. Non-player characters are stuck moving up, down, left or right, often in a straight line, and in some cutscenes simply hop around to show emotion. Some characters, particularly the player character and rival, will change the expressions on their faces, where others express their emotions through speech bubbles above their heads. With the game’s 3D engine demonstrating the ability to have characters animate nicely and show expression, it seems like a waste to not make the most of it. Viridian Forest: Lush. Beautiful. Warm and pleasing. Lags the game. While human characters aren’t the most detailed in the game, the environments have certainly been given attention. Kanto, as it’s represented in these games, has been adorned with a range of flourishes. Pay good attention to the little things that make the world come to life, such as windmills, tall reeds, and small bushes that you and your Pokémon can actually tread through. There’s an astonishing amount of detail shown off in each area of the game, from the animated, leaking water in caves, to the different patches of flowers in each town, to the background objects in each city. It does come at a small cost, though — some places have so much detail that it may cause the Nintendo Switch to lag at times. 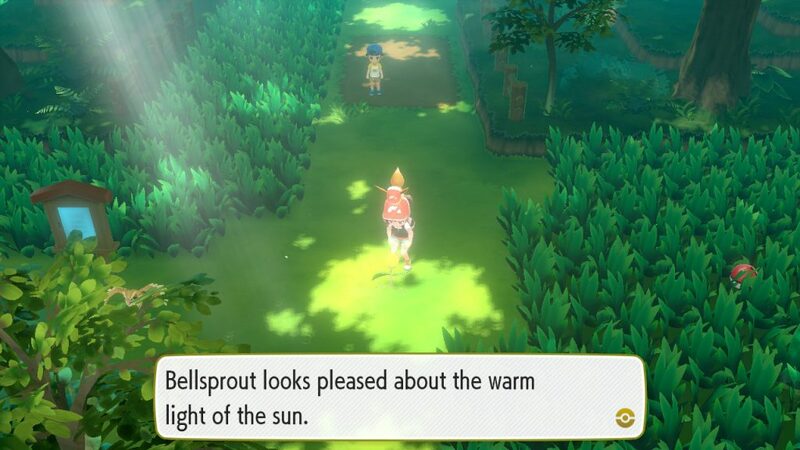 It’s not as bad as it can be with Pokémon Sun and Pokémon Moon, where double battles could cause so much lag it seemed unplayable, but when trawling through the lovely Viridian Forest, where Pokémon are abundant, leaves fall, and the trees cast beautiful shadows, you might notice the lag when you’re searching for rare Pokémon such as Bulbasaur. Sticking to the visual style of the traditional games also means Let’s Go doesn’t take full advantage of what the Nintendo Switch has to offer. Where Pokémon Sun and Pokémon Moon, as well as Ultra Sun and Ultra Moon, attempted to push the 3DS, the top-down perspective doesn’t highlight every environment in full 3D to the extent a lot of other Switch games do. To what extent this matters to you is fairly subjective — and again, this game does remaster the first-generation games closely. Overall, the visual design lends itself to being a remake, and despite at first glance sticking closely to traditional Pokémon designs, Let’s Go, Pikachu! and Let’s Go, Eevee! don’t limit themselves to traditions, rather adding many unique flourishes to bring out what would otherwise be a generic world that many of us have played through before.